First off, let me say that I'm sorry to see the Diary go, although I understand the reasoning: I've barely found time to do anything I'd like to do of late. Take a rest, Zendexor, you dun good. Secondly, I know I was going to continue going through Old Mars, but I don't have it with me at the moment so by necessity I'll be covering other material. 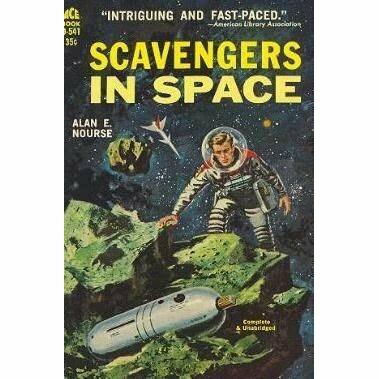 Namely, Scavengers in Space, a short novel by Alan E. Nourse. Some readers may remember Nourse for his short story Brightside Crossing, certainly a memorable tale if I ever read one. Instead of Mercury, Scavengers takes us away from the Sun, to Mars and then further still to the asteroids. We follow the Hunter twins, brothers whose father Roger died suspiciously while out prospecting in the Belt. With the help of family friend Johnny Coombs, they set out to prove that their dad’s death was not merely accidental, and that the Jupiter Equilateral Corporation murdered him to get their hands on the “bonanza strike” he claimed to have found before his death. It's a fine set up, and the implications of their discoveries quickly balloon - I don't want to say too much, but let's just make clear that haters of COMOLD have nothing to fear from this one. If a criticism is to be made, it's one that many books of its generation share: there’s a mysterious absence of any and all women at any point in the story. The brothers mention briefly that their mother passed, and after that females are mysteriously vanished, without a trace or even a mention. Asimov and Heinlein at least made habits of putting women into their tales now and then, so I don't think it's necessarily an unfair criticism to make, even if one must brace oneself for certain antiquated attitudes when reading older fiction. But world-building holes aside, Scavengers in Space is a fine addition to our picture of the OSS Asteroid Belt, and I recommend it to any fan of the genre who’d like another trip Beltward!